Everyone needs to supplement with Vitamin D - it's official. An article by Ben Brown, Technical Director at Viridian Nutrition. JULY 2016: Public Health England has released and official statement advising everyone to take vitamin D. But while the advice is much needed, it may not be enough to address the issue. The statement from Public Health England (PHE) is based on a new report from the Scientific Advisory Committee on Nutrition (SACN). Previously SCAN said there was insufficient evidence to make recommendations for vitamin D, but have updated their report with new guidelines for dietary supplementation. Because it is difficult to obtain sufficient vitamin D from sunlight and natural or fortified food-sources through autumn and winter people should consider taking a daily supplement containing 10 micrograms (400 IU) of vitamin D in autumn and winter. People at high risk of deficiency - such as people with low sun exposure like those in institutions such as care homes, and dark skin from African, Afro-Caribbean and South Asian backgrounds - should consider taking a supplement all year round. Children aged 1 to 4 years should take a daily 10 microgram vitamin D supplement. And all babies under 1 year should have a daily supplement providing 8.5 to 10 micrograms of vitamin D.
In summary, everyone at every age should take 400 IU of vitamin D a day through autumn and winter or all year round in the case of infants, children and people at high-risk. While this is a welcome opinion and is generating much needed awareness about the importance of vitamin D deficiency – an issue of epidemic proportions - it may not be enough to address the problem due to a few inadequacies. Dr Louis Levy, Head of Nutrition Science at PHE, said “everyone will need to consider taking a supplement in the autumn and winter if you don’t eat enough foods that naturally contain vitamin D or are fortified with it.” And the Times listed daily servings of foods required to obtain the recommend 400 IU of vitamin D, including 12 Eggs, or 2 and a 1/2 cans of Tuna. This implies vitamin D deficiency is a dietary issue, and that healthy eating could be sufficient to address the problem. But it is clearly not. Assuming 400 IU per day is an ideal for children and adults, eating 12 eggs a day is a ludicrous suggestion and perpetuates the myth that vitamin D deficiency is a dietary issue. Sunlight & supplements, not diet, are the solution. The report suggests no more than 400 IU, but this is likely to be insufficient to treat or prevent vitamin D deficiency in adults, especially high risk groups. The Endocrine Societies Guideline on vitamin D defines amounts of supplemental vitamin D needed to prevent and treat deficiency. Based on amounts required to maintain a healthy blood level they recommend 1500-2000 IU daily for adults, the elderly and pregnant women. Importantly the above 1500-2000 IU recommendation for adults is based on maintenance of healthy levels, not correcting deficiency – in which case a higher dose would be required. In vitamin D deficient people 5,000 IU per day for 3 months achieved a healthy blood level in most (93%) people, but less than half improved on a dose of 2000 IU. And 4,000 IU daily during pregnancy was safe and effective, whereas, in comparison, 400 IU was completely ineffective at achieving adequate blood vitamin D levels. So while the PHE report is a great step forward, the myth that we can get all the vitamin D we need from a healthy diet is being perpetuated in the media which downplays the importance of vitamin D supplements as a simple, safe and cost-effect solution to a major public health issue. The report also falls short of recommendations on supplementation likely to prevent and treat deficiency in adults, but while we wait for the next update I will continue to take 2000 IU daily for a few more years, which is maintaining my blood levels just fine. 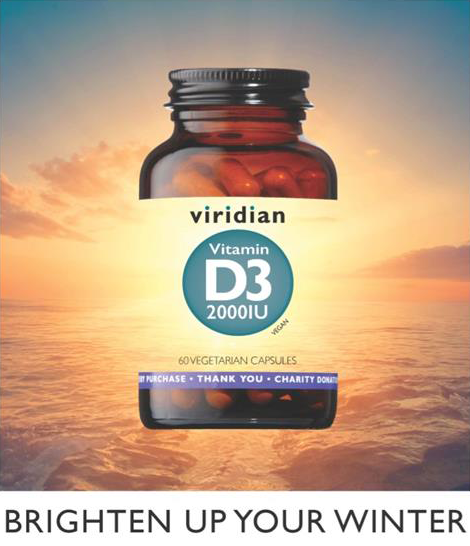 Vitamin D supplements from Viridian Nutrition can be found in specialist health food stores worldwide. 1. Public Health England. PHE publishes new advice on vitamin D. Press release. 21, July, 2016. 2. SCAN. SACN publishes new recommendations on vitamin D. Press release. 21, July, 2016. 3. Gibbons, K. Doctors warn everyone to take vitamin D pills. The Times, July 21. 2016. 4. Holick MF, Binkley NC, Bischoff-Ferrari HA, et al. Evaluation, treatment, and prevention of vitamin d deficiency: an endocrine society clinical practice guideline. J Clin Endocrinol Metab. 2011 Jul;96(7):1911-30. 5. Diamond T, Wong YK, Golombick T. Effect of oral cholecalciferol 2,000 versus 5,000 IU on serum vitamin D, PTH, bone and muscle strength in patients with vitamin D deficiency. Osteoporos Int. 2013 Mar;24(3):1101-5. 6. Hollis BW, Johnson D, Hulsey TC, Ebeling M, Wagner CL. Vitamin D supplementation during pregnancy: double-blind, randomized clinical trial of safety and effectiveness. J Bone Miner Res. 2011 Oct;26(10):2341-57.